Fainting is sudden loss of consciousness, usually temporary and can be caused by lack of oxygen in the brain. Lack of oxygen in the brain can be caused by hypotension and low blood sugar. When the brain detects low levels of oxygen, the body starts breathing faster or hyperventilating to bring the level back to normal. As an outcome, the body triggers a fast heart rate to provide more oxygen to the brain. A fast heart rate will result to hypotension or low blood pressure. Hyperventilating along with hypotension will result to weakening of the muscles and fainting. The person usually regains consciousness within a minute or two. If the person starts to faint, catch him/her slowly and lower to the ground. 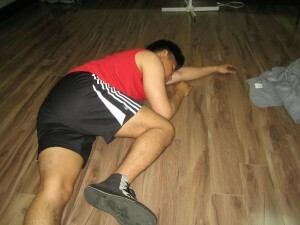 If an individual faint, they could not protect themselves using their hands when falling. Raise the legs above the level of heart for proper flow of blood in the area and rest for at least 10-15 minutes. Loosen constricting clothing such as tie or collar to make him/her comfortable. Position the affected person on his/her back, then tap or shake to see if the person has already regained consciousness. Some people who have fainted usually regain consiousness quickly between 20 seconds – 2 minutes. If the person experiences a headache, seizure, numbness or tingling sensations, difficulty breathing and chest pain before fainting, medical attention is required. If the affected person is already conscious and stable, give him/her food and water to prevent dehydration and hypoglycemia which are the common causes of fainting. Avoid letting the affected person get up too quickly to prevent another episode of fainting. If the affected person has a head injury and has difficulty breathing, pain in the chest and a severe headache or suffering from heart conditions, immediate medical care is required. In case the individual does not regain consciousness normally, check the pulse by placing the index and third fingers on the neck of the person on the side of the windpipe and feel for a pulse. If there is a pulse, raise the leg of the person at least a couple of feet above the ground for proper flow of blood in the area. If there is no pulse, start CPR. Place the heel of one hand at the center of chest and place the other hand on top of the first. Avoid bending the elbows. Use the whole weight of the body and compress the chest at least 2 inches down. The material posted on this page on fainting is for learning purposes only. Learn to recognize and manage sudden medical emergencies including fainting by taking a first aid and CPR class with one of our training providers.